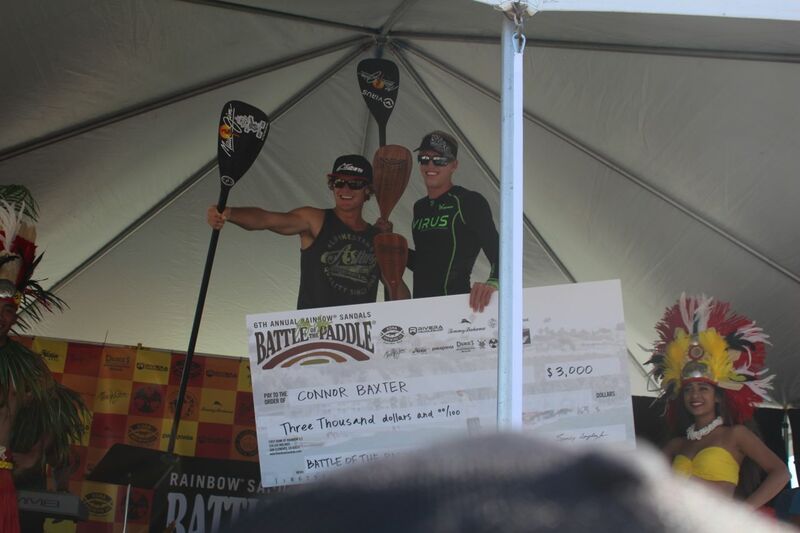 The 2013 Battle of the Paddle – also known as the BOP was a fantastic and exciting event. 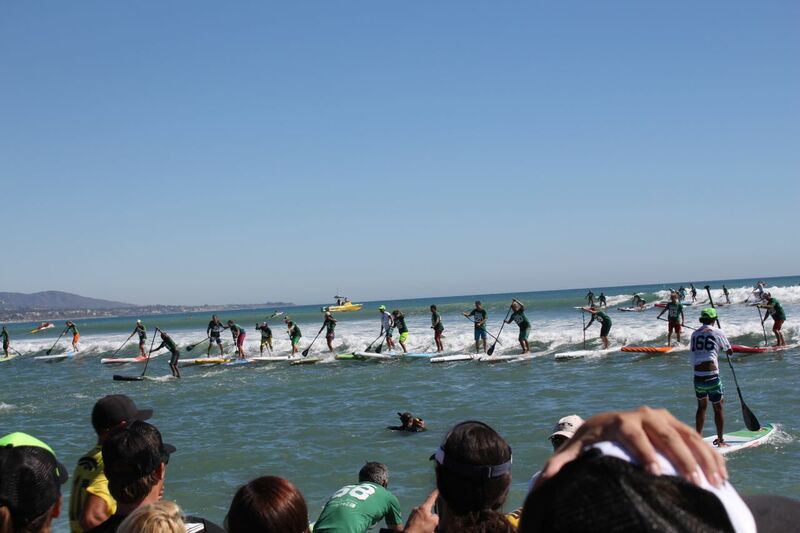 Just like last year, they kicked it off with two morning heats to eliminate so many people in the finals. In each heat there were 60 plus people and they were taking half. So as I got ready for the first heat – I knew what I had to do. Since they were taking a lot of people I knew that I didn’t have to paddle my heart out – just as hard as I needed to, to make it through. The horn blew and I quickly ran down the beach and jumped onto my board. I needed to sprint pretty hard to the first buoy to get out of the carnage and into clean water. I got into my steady pace and paddled my two and a half laps with little effort. I kept this pace until the end and came in around fourth place. The next race for me was the finals which was at 2:30. In between the qualifiers and the Elite finals they first had the age group race – with over 400 competitors – that spanned from age 7 to 76. There was a huge train of people and by about the middle of the race – it connected into one huge rectangle of people. Next up was the Women’s Finals at 1:30. This was the first year the organizers gave the women their own race – which was great. For the first time I got to watch – and it was very exciting. Annabel took the win! So – I just rested up, drank lots of water and got prepared to go to battle. As it was getting closer and closer, I got more and more pumped up and ready to go. I finally was on the start line and ready to go more then ever. Board and paddle in my hands, I was energized and just waiting for that horn to blow. There were still so many people in the Elite race that we were all shoulder to shoulder crammed onto the starting line. And all of a sudden the horn blew and I sprinted to the water. When I went to set my board in the water there were so many people all around that I set my board on top of boards not even in the water. Once I finally got my board and paddle into the water I had to navigate through a bunch of people to try to get back up to the top. We turned the first outside buoy and headed inside to the notorious Hammer buoy. A few of us rounded the buoy clean and headed out to the next buoy. When I turned the buoy to head back to the beach, there was a little bump that only Kai and I caught. We hit the beach at the same time for our first beach run. Then off the beach and on to our second lap. On this lap Kai drafted me the whole lap until the second to last leg where he was all powered up. He sprinted passed me and somehow got this wave out of nowhere. I got the next wave and as I turned the buoy – I put so much effort into it I popped my rib out. 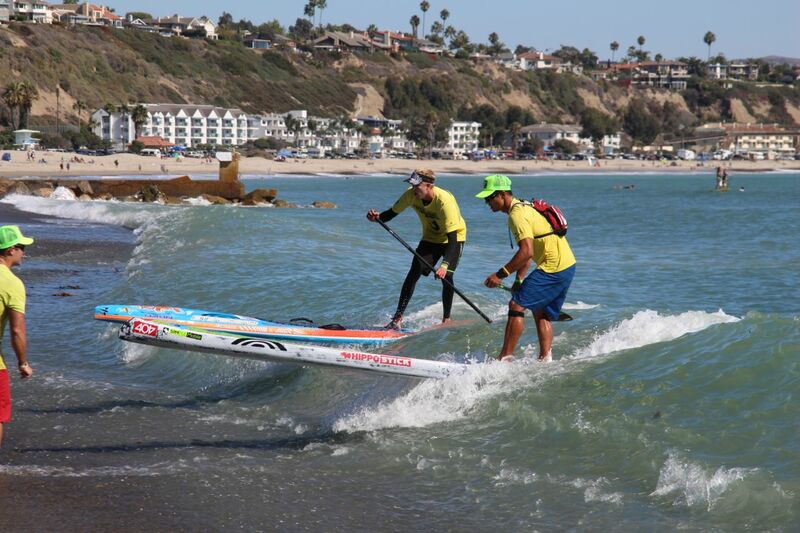 So I stayed in second until the next buoy and then Danny caught a wave and caught up to me. So now Danny and I battled it out for the next two laps until the final one. We both hit the beach together, sprinted fast and paddled hard off the beach. At this time my rib was sore, but I just kept paddling my hardest. Going into the third buoy, I caught this little bump and notice Danny missed it – so I took that as my chance to get a good gap on him and didn’t let up on the throttle and didn’t look back. I just kept it going and paddled super hard. Coming into the second to last buoy I notice I caught up a little to Kai, so I kept it going and after the last buoy turn, almost catching the same wave he was on heading to the beach – but it wasn’t enough which put me in second place. I was super stoked and even more hungry for next year. So having my rib pop – I had to see a sports doctor who luckily popped it back in. But unfortunately, this put me out of the Long Distance Race on Sunday. But I was super stoked to be able to watch it and see Zane pull off the third place in the Elite race. Congrats to him for a great race! Also Annabel for another first place victory! And I also got to watch all the Groms battle it out. Which was scary to watch, because I know these kids are all going to be beating me soon if they keep it up. But at the same time – so sick to see that many kids doing this amazing sport. 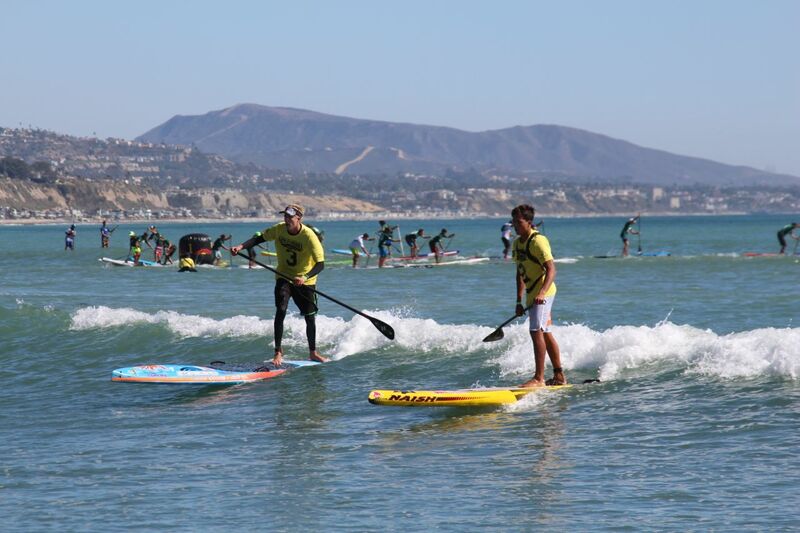 There were three kid races of different age groups – followed by the kids surf relay. Unbelievable talent! 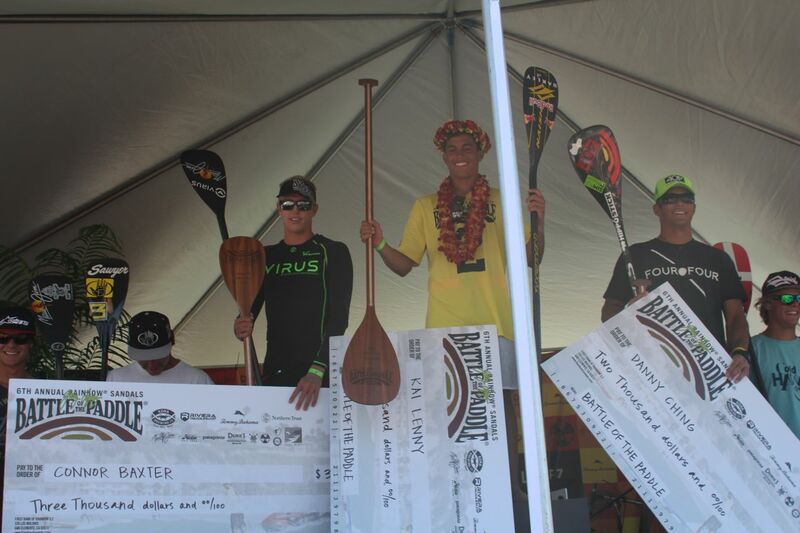 I want to thank my sponsors for all their support – Starboard, Maui Jim Sunglasses, Rainbow Sandals, Futures Fins, Virus Sportswear, Dakine, Trident Sports, GoPro, OnIt Pro, Waterman’s Sunscreen, Garmin, Igloo Coolers, Sunrite Maui, Hammer Nutrition, iDcard, EFX and Hi-Tech Sports. Also a big Mahalo to all the event organizers and volunteers. Great Event!! Thanks to Sparky, Pat, Barrett and Gerry! 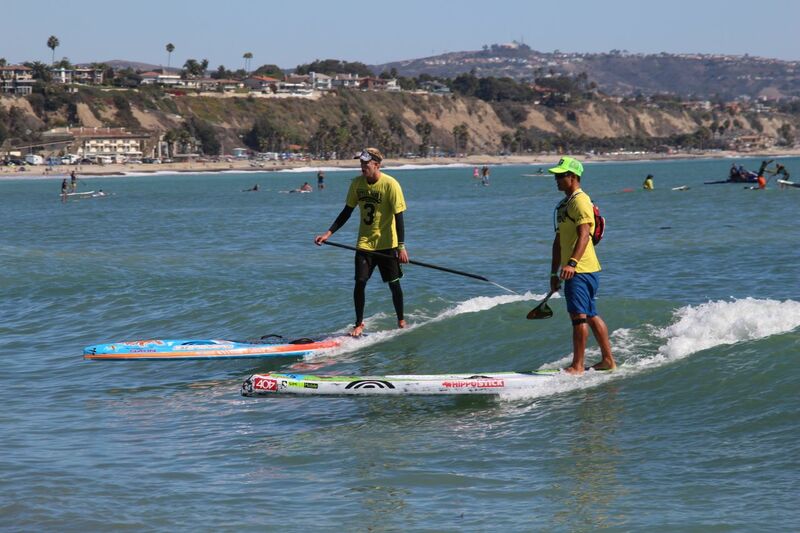 Now this is what the Battle is about – 17 people on One Wave – about to hit the beach. Carnage. Connor and Zane celebrating their 2nd and 6th place finishes! !